Bus riders spend a lot of time stopped at red lights, but they don’t have to. A technology called transit signal priority, or TSP, speeds up transit trips by adjusting signal timing so buses hit more green lights and fewer reds. TSP has a proven track record in New York, but on several routes, implementation is years behind schedule. 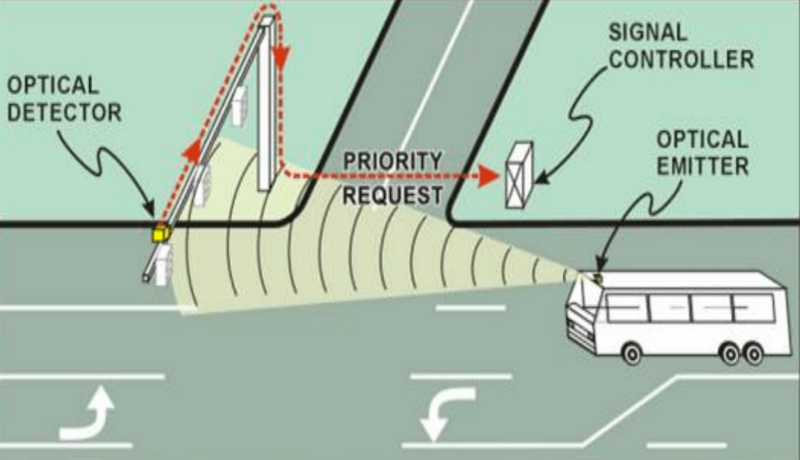 Transit signal priority uses GPS devices on buses to send a signal to a traffic management center, which can then either hold a green light as the bus approaches or shorten the amount of time a bus is stopped at a red light. According to NYC DOT, the technology has sped bus trips between 10 and 18.4 percent. A recent evaluation of signal priority on the M15 Select Bus Service [PDF] said “the system is working well… [and] the city has the option to deploy citywide.” The problem is that only a handful of routes are outfitted with TSP. The city’s 2011 PlaNYC update set a goal of adding transit signal priority to 11 routes citywide, but didn’t set a target completion date. So far, the city and the MTA have rolled out transit signal priority on just three corridors. Seven routes remain in various stages of planning or study. New York’s first TSP system was installed at 14 intersections along Staten Island’s Victory Boulevard in 2008. Signal priority cut bus travel times by 16 percent during the morning rush hour and 11 percent during the evening [PDF], and 19 additional intersections on the route are in line to get it. The city’s first Select Bus Service route, the Bx12 on Fordham Road, received TSP later in 2008, covering 35 intersections over 2.4 miles between Broadway in Manhattan and Southern Boulevard in the Bronx. Since then, the only route to receive upgrades has been the M15 SBS, which in May 2013 received signal priority for 50 buses and 34 intersections along 2.2 miles of its route south of Houston Street. The M15 was the first in the city to use newer technology that communicates with the traffic management center, the MTA says, with Victory Boulevard and Fordham Road relying on older “line of sight” devices. Bus riders on other routes are still waiting for improvements, in some cases years after blown deadlines. When Select Bus Service launched on the S79 in 2012, transit signal priority was a big part of the plan. DOT calls it “the most extensive implementation of TSP in New York so far,” covering 70 intersections on 14 miles in two boroughs, mostly along Hylan Boulevard. When the service launched, City Hall said signal priority would be up and running by spring 2013. The completion date was later pushed back to 2014 [PDF]. Now, DOT says it will be done by the end of this year. A similar story is unfolding on the B44 SBS, where DOT and the MTA are planning signal priority at 34 intersections on 4.4 miles of Nostrand Avenue south of Farragut Road. When it launched the service in late 2013, DOT said the signal upgrades would be done by spring 2014. DOT now says the plans are “well underway” and, like Hylan Boulevard, will be completed by the end of this year. DOT says signal priority is “ready to be implemented” this year along 5.3 miles of the Bx41 SBS, covering 67 intersections mostly on Webster Avenue, and along 4.2 miles of the B46, covering 53 intersections on Utica Avenue and Malcolm X Boulevard, from Broadway to Kings Highway. The MTA Board has approved adding TSP equipment on up to 200 buses on the four routes planned to get the technology this year. After this year, signal priority could come to additional routes. Last fall, the city studied 63 intersections for M60 Select Bus Service, and DOT said last month that it is considering signal priority on the route between Amsterdam Avenue and Second Avenue. In Queens, DOT is developing TSP for bus service on 3.3 miles of Hillside Avenue, covering 43 intersections between 165th Street and Braddock Avenue. Future expansions could bring signal upgrades to 53 additional intersections on Hillside Avenue, Main Street, Kissena Boulevard, and Parsons Boulevard. These potential expansions sound promising. It’s not the first time, however, that an expansion of TSP has seemed imminent in the seven years since the technology first rolled out in NYC. It’s probably safe to say that cost is not what’s holding implementation back. The equipment is priced at $4,219 per bus, according to the MTA, or less than a million dollars to outfit all 200 buses slated to receive it this year. DOT says its only cost is for evaluation and management, and the city doesn’t bear any infrastructure costs. Thanks for writing on this. It seems like TSP is sold as a benefit of SBS but then basically everybody forgets about it once the SBS rollout happens. Offboard fare collection and Proof of Payment have pretty much the same effect on speeding up service, and the latter is a best practice for all transit, not a BRT feature. Thus the SBS you’re talking about actually has no BRT features at all and is really just regular bus service. True though that’s traffic dependent isn’t it? Whereas POP ought to be universal. It depends on the particular situation. If you’re talking about a lightly-used route deep into The Bronx or Staten Island, offboard fare collection might actually increase travel times, as it makes it more likely for people to miss the bus. (Meanwhile, it doesn’t save much time for the riders already onboard, because the amount of time saved by 1 or 2 people walking on without dipping a MetroCard is minimal). That’s technically true, but if you want to be really literal there actually should be *no* off-board fare collection except at very busy stops. What people mean when they say “off-board fare collection” is POP. POP is not something that needs to be done off-board. All it is fare collection that does not involve the bus driver. There should be TVMs on buses that allow people to purchase when they board, assuming TVMs aren’t available at their stops. Transit priority at traffic signals is one of the easiest ways to speed up NYC's sluggish buses. But DOT is aiming to add it on just 20 more routes by 2020. Instead of the five routes per year where DOT is currently planning to implement Transit Signal Priority, Levine's bill would mandate at least 10 routes annually.